Since I went Gluten Free in late 2013 I have learned many things. One, I crave snacks more than ever. Sometimes I just get sucked into a “Why me?” mindset and crave everything that I can’t have…even if I never craved them before the GF lifestyle. Certain things I am thankful for…potato chips. They, for the most part, are Gluten Free. But things like cheese puffs and cookies are on the “DO NOT EAT” list. Inside were a dozen treats. Eleven items I had never seen before; one I had, but more on that later. I shared most of the items with my family, as they will be eating the products if I seek them out to purchase again. The two items we LOVED were well worth the price of the box. K.C. Pomering, also known as G-Free Foodie on Facebook, was always finding great Gluten Free treats and sharing them with her friends on social media and her blog gfreefoodie.com. So she decided to start a box company so she could just send them samples of the these yummy treats that she sourced out. 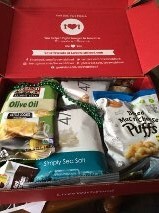 But here’s the coolest part of the LOVE WITH FOOD by G-FREE FOODIE Box, for as little as $24.50 a month you not only get a box of GF yummies sent to your house or office, but you also feed hungry children. That’s right, two meals are donated to hungry kids for every box you receive so you are not only feeding your cravings, but your soul as well. *Key Lime White Chocolate Chip Cookies from WOW Baking Company- This is the item that I already knew about only I didn’t realize it. These cookies were WOW!!!!! The soft and tender cookie with a brilliant tart flavor were accented by just enough white chocolate chips to balance the tart and yet not make them too sweet. After I immediately fell in love with them and headed to the website…I realized that this is also my favorite brand of peanut butter cookie from Whole Foods. I get nasty when they’re not in stock. I am even more in love with this company than I was before. YUMMMY. And this discovery was worth the price of the box alone. 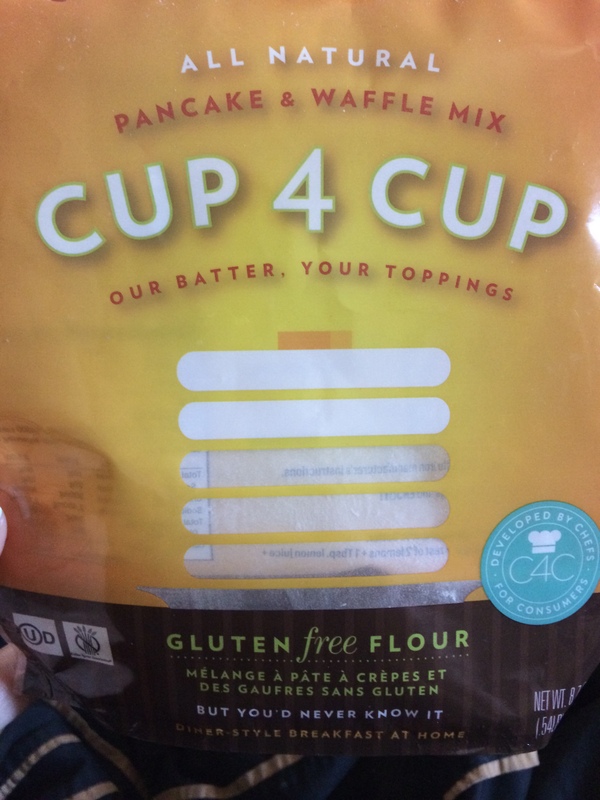 *Pancake & Waffle Mix by Cup 4 Cup- A good pancake mix is hard to find gluten free or not. This was delicious and easy to use. Simply add milk, butter and eggs. My boys didn’t even know this was gluten free. They were impressed with the light and fluffy texture and the great flavor. These I will seek out again and again!! * a bag of Olive Oil Potato Chips by Boulder Canyon-These were okay. As I mentioned before I eat potato chips all the time. I was expecting something amazing and what I found were …well…potato chips. Nothing bad…but nothing out of the ordinary. *Two bags of 479 Degrees Artisan Popcorn -. Simply Sea Salt and Sea Salt Caramel. These were a tasty little treat. Again, nothing that I normally can’t find on the shelf in any grocery store. *Two bags of Baked Mac n’ Cheese Puffs by Snikiddy- These cheesy baked corn and rice puffs were just like the real deal…without the fake orange stuff that gets on your fingers. My family all enjoyed them and we will be seeking them out. *Two different mini bars of Scharffen Berger- The Milk Chocolate with Sea Salted Almonds and the 72% Dark Chocolate with Sea Salted Pistachios. The quality of the chocolate was solid. I am not much of a chocolate girl so these were wasted on me. *Mango Staycation Trail Mix by Peeled Snacks- For the most part trail mix can be made with any dried fruit and chocolate and nuts…and still be gluten free. This brand had moist fruit and unsalted nuts. Not something I would seek out when Trader Joes is around the corner. *Dark Chocolate Suncups by Suncups- My fault for having incorrect expectations. I expected more of a dark chocolate Reeses Peanut Butter Cup. I know the package said Sunflower Butter…but they looked like the candy I expected to know and love and I was sorely disappointed. I have learned with certain cravings in the land of gluten free…if it ain’t what you crave …do without. These were just not worth 115 calories to me. This box is well worth the monthly fee, especially if you don’t have a plethora of GF resources near you. I know the cost of GF treats and you will definitely get your money’s worth, plus you are helping others as well.